It feels like the UK is more divided than ever by Brexit. I voted to remain in Europe in the 2016 referendum because I believed that it was the right and the best thing to do for our country and for our children’s future (as I explained at the time in my blog post How should I vote in the EU referendum?). I still believe, fervently, that we should stay in the European Union. But I respect the fact that many people, including some who are dear to me, are equally fervently of the opposite view. I don’t want to fall out with them over it, and I definitely don’t want to argue about it with them at Christmas. A few days before the referendum I went with my daughter, who was 17 and very unhappy that she was too young to take part in the vote, to see my parents, who are in their seventies. We talked about how we were planning to vote, and why, and my daughter and I did our best to persuade my Daily Telegraph-reading dad to vote Remain. My dad is a kind, intelligent, hard-working man, and he’s as passionate about leaving Europe as I am about remaining. He believes that leaving Europe is the best thing for the country, and he voted in line with that belief – as he had every right to do. I was devastated by the referendum result. I felt like I didn’t belong in my own country, despite being born here, and I feared for the future. A few days after the referendum result was announced, I again had to drive my daughter to my parents’ house. I was so upset about the result that I said that I’d wait for her outside, as I couldn’t bear to discuss Brexit with my dad. She was also sad about the referendum but, wisely and calmly, she told me that I had to go into the house and that my dad was still my dad, whichever way he voted. And she was spot on. On entering the house, I told my dad that I was too upset to talk about Brexit. When he ignored me and started trying to explain why he’d voted Leave, I left the room. Since then, my dad and I do not discuss Brexit, apart from obliquely when he asks me how our application for Italian citizenship is going (my husband’s Italian – you can read about the progress of our family quest to remain European here). In December 2017 my healthy, active, beloved dad had a cardiac arrest. He was walking along the road when his heart stopped. Miraculously a lady who was driving past saw him lying on the ground, stopped her car and saved his life with CPR. When he woke up from an induced coma in hospital a few days later he didn’t recognise any of us and couldn’t remember what had happened. Sitting at his bedside I gleefully told him that Brexit had been reversed, and took it as a positive sign that he didn’t believe me. My dad’s memory and strength slowly improved and he came home just in time for Christmas, as pro-Brexit as ever. I still can’t accept Brexit, because of the dishonesty of the Leave campaign (who can forget the infamous £350 million NHS bus claim, which the head of the UK Statistics Authority has since said was ‘a clear misuse of official statistics’?). I still say that leaving the EU is a huge mistake which will make our country poorer in every way. If there’s another referendum, I will be voting to remain in Europe. But I respect my dad’s (and other people’s) right to hold the opposing view, and I don’t want to talk, or argue about Brexit at Christmas. At Christmas I just want to enjoy being with my family and friends, to think about what really matters in life, and to be thankful that my dad survived. 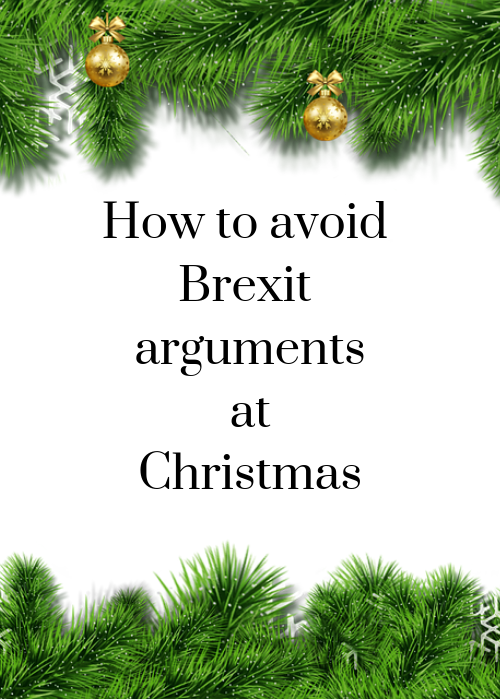 If you want to avoid Brexit arguments with people that you love over the festive season, here are my tips. Accept that everyone has the right to their own opinion, even if it’s different to yours. If you don’t want to talk about Brexit, tell people so, politely. Have some innocuous questions at the ready in case you need to change the subject. For example, you could ask about someone’s holidays, hobbies or pets. Play bingo, charades or board games together. If you have kids, ask them for ideas of how they can support your Brexit-free plan – they will probably have some great ideas of how they can distract people from talking about it. If all else fails, you can always just leave the room to remove yourself from Brexit discussions. Do you disagree over Brexit with any of your family and friends? 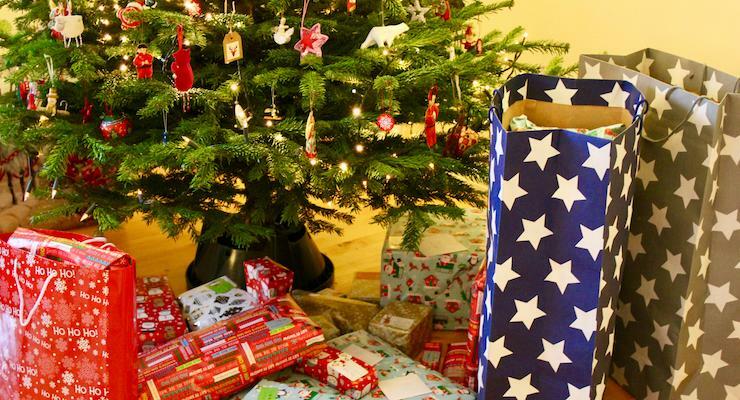 If so, how do you deal with it, and has it affected how you spend Christmas? I am so sorry that this post even had to be written. I’m from Dublin and really worried about how it will affect our relationship with our nearest neighbour. Thanks for all your posts which I love reading. Wishing you a peaceful Christmas. Thank you Caroline, and best wishes for Christmas to you too. It’s all so worrying, and I’m so sorry for the whole situation and for how it affects Ireland. No need to be at all Gretta.. now as for my sister who voted for it and is now busy renewing her and her sons EU passport…probably as well she’s not home this Christmas! I so identify with this post, Gretta. And what useful tips to avoid arguments at Christmas. It’s very true that we need to value each other, as life is fragile. The day after the referendum I spoke to one of my brothers on the phone, and he said he’d voted Leave. I reacted with anger and disbelief. Neither of us has mentioned it since, although I can imagine that he might have changed his mind. It’s a taboo subject now, unfortunately. But I think that for a lot of voters it was an emotional decision, and so it’s hard to reason with them. I’m so upset about Brexit that I avoid talking about it to some people who might have voted Leave, in case I end up feeling angry and resenting them! Brexit has caused a lot of tension in so many relationships. You’re right Jane. It’s so difficult, because in many ways we should be talking about Brexit, because it’s so important, but if talking about it ends up damaging relationships, then it’s understandable that the topic is often avoided. Yes, it can be hard to gauge when It’s “safe” to talk about it! Sometimes it might be worth gently asking the “Is this what you voted for?” question and trying to have a rational discussion. It’s such a HUGE issue, with great generational divides, I fear lots of family Christmases will suffer from Brexit being especially hot and contentious at the moment. Interesting ideas there Monika! It is such a huge issue, as you say.